City planners get their first look at proposed uses for the 64-acre General Electric gear plant site on June 24, but the Market Basket grocery chain has yet to unveil a schedule for opening a local store on GE’s former Federal Street land. Federal Street owner Charles Patsios said he is waiting for the Demoulas family “board room” to inform him when they plan to add a Lynn store to their grocery store chain. “I hope they can get back to business as quickly as possible. Their stores are wildly successful,” Patsios said. Patsios, a Swampscott developer, bought the 24-acre Factory of the Future site at Western Avenue and Federal Street from GE in May 2013 with plans to make Market Basket his primary tenant. 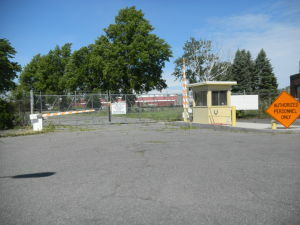 The River Works entrance off the Lynnway is heavily secured but city planners see it becoming a public entranceway to future development on former gear plant land. He said Market Basket corporate principal Arthur T. Demoulas has met with city officials and local Market Basket plans include altering traffic lanes to allow customers to turn with ease into the site and locating a bus stop on the site subject to state approval. “Market Basket, in cooperation with the mayor, has really stepped up efforts to make something attractive down there,” Patsios said. Attempts to reach a company spokesman on Wednesday were unsuccessful. Although it dominates the city’s center, the Factory of the Future site is much smaller than the former gear plant land located off the Lynnway near the Saugus River. City Inspectional Services Director Michael Donovan said the site’s anticipated sale will be completed by Sept. 1 with the Planning Board getting an initial look at plans for the land on June 24. “It’s the most highly valued property in the city of Lynn. With rail access, the site becomes even more valuable,” Donovan told Planning Board members Tuesday. River Works spokesman Richard Gorham on Wednesday said GE representatives are “closing in on finalizing a sale with a prospective buyer” with an initial agreement possibly in place this month. The gear plant land is located next to the commuter railroad line running from Boston through Lynn with a River Works stop on the rail line. City planners have already said the train stop makes the site a good location for residential and commercial development aimed at attracting people who live or work in Boston. Donovan said the site is also a former industrial location that is contaminated and needs cleaning up. “What is there can be cleaned,” he said. Patsios said the purchase agreement he signed with GE calls for the corporation to handle environmental monitoring on the Factory of Future site and said monitoring equipment is in place. “If something needs to be done, it will be done,” he said. Patsios said the Market Basket site’s “bigger picture” includes development around the proposed grocery store. “If this was up to Arthur T. Demoulas, we would know when we would be shopping but that is convoluted by actions in the board room. As soon as they finish whatever has gummed up the works, they can get back to business,” he said.